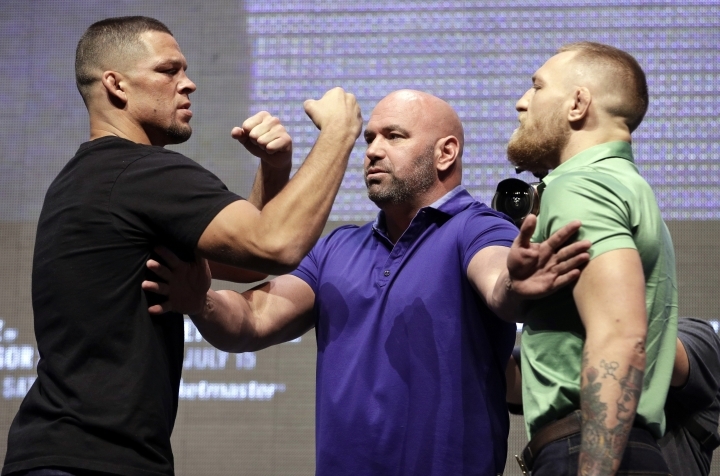 LAS VEGAS — From the late entrance to the expletive-laden comments to the bottle-throwing finale, Conor McGregor and Nate Diaz left no doubt that the drama will definitely be there for their highly anticipated rematch at UFC 202. McGregor showed up about 30 minutes late Wednesday to his news conference with Diaz to promote Saturday night's main event at T-Mobile Arena. So Diaz started without him. "Nah I don't care, it's rude," Diaz said when asked whether he was bothered by the featherweight champion's tardiness. The fight itself is late in coming. Diaz beat McGregor by submission in the second round of a welterweight bout March 5 at UFC 196, ending McGregor's 15-fight winning streak. McGregor had asked for a quick rematch and it was scheduled during the landmark UFC 200 card in July, but McGregor announced he was retiring during the spring. He later relented, but by then UFC had dropped him from that card. Saturday's rematch was announced in June. When asked if Diaz thinks he exposed McGregor as a better talker than a better fighter in their first fight, Diaz said: "I think I beat him, I thought I could beat him the whole time." Not surprisingly, the first question for UFC President Dana White at the beginning of Wednesday's news conference was about McGregor's whereabouts. White quickly replied, "He's on his way." He was. The crowd erupted when McGregor walked on to the stage about 30 minutes late. "I was told half (past) one," McGregor joked. "Vegas traffic is heavy as well this time of year. There must be a McGregor show going on because the place is tagged out." "Look, I'm just happy to be here and I'm ready to fight," he said." You know you're going to get a fight when I'm here." As McGregor was answering questions, Diaz stood up and left the stage, and he and his entourage moved to leave the theater. Diaz and McGregor and members of their groups yelled at each other and taunted one another and eventually began hurling water bottles at one other. Police and security separated the two groups and the news conference ended. White wrapped up with an apology, "Sorry guys, see you Saturday."